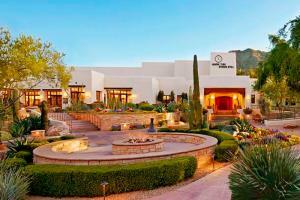 The Camelback Inn, a JW Marriott Resort & Spa has been unveiled after a much-anticipated $50 million renovation. The gracious hospitality and Southwestern charm of this AAA Five-Diamond resort is yours to rediscover. Experience Scottsdale's most celebrated Spa or challenge your game on 36-holes of championship Arizona golf. Recreation options are endless and include swimming, hiking, shopping, biking and more. Approximately 9 miles from the Phoenix Airport. BLT Steak - Chef Laurent Tourondel's adaptation of the modern American steakhouse; Rita's Kitchen - fresh, regional recipes; R Bar - specialty margaritas and hand-crafted cocktails; Hoppin' Jack's - patio and poolside dining; Sprouts - natural, organic foods. Local attractions include the Desert Botanical Garden, Frank Lloyd Wright's Taliesin West, The Heard Museum, Rawhide Western Town, Phoenix Art Museum.